; $1.49 All Purpose Potatoes 5 Lb. Bag or Fancy Yellow Onions 3 Lb. Bags; 4 for $10 General Mills Cereal, Nature Valley Granola Bars; $2.99 Fiora 12 Roll Bath Tissue; $5.99 lb Buffalo Blue Chicken Salad; $2.99 Store Baked Lemon or Blueberry Pudding Cakes; $1.78 lb All Natural Pork Shoulder Western Style Ribs; $3.48 Shady Brook Farms Fresh Turkey Sausage; 2 for $7 McCain Potatoes; 2 for $5 Swanson Hungry-Man Entrees; $6.98 lb Medium Snow Crab Clusters; $6.49 Dove 6 Pack Bar Soap or Body Wash; 2 for $5 Aquafresh Extreme Clean Toothpaste; 4 for $5 Red Pack Canned Tomatoes; 2 for $6 Select Kellogg’s Cereals; 10 for $10 Breakstone’s Cottage Cheese Doubles; $1.99 Snapple; 2 for $5 Arizona Iced Tea; $2.99 lb Large Beefsteak or Tomatoes on the Vine; $2.99 Fresh Raspberries; $12.99 Dozen Rose Bouquet; $2.99 Fresh Brussels Sprouts; $6.99 6″ Mini Roses; 2 for $5 Arnold Classic Bread; $1.49 Kraft or Velveeta Cheese Slices; $4.99 All Liquid Laundry Detergent. 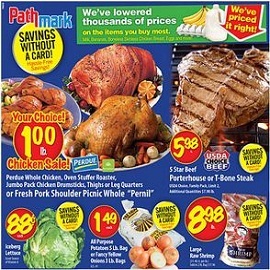 To see the weekly circular for your favorite Pathmark store, search by ZIP Code or City State.